Congestion occurs as a result of blockages in your sinuses. Your sinuses are located in your forehead, cheeks and behind your eyes. Blockages may be caused by bacteria, a virus or fungi and result in pressure and facial pain. You may be able to alleviate your clogged sinuses with the help of cinnamon. However, check with your doctor before engaging in any home remedy for sinus congestion. Cinnamon has been used as a remedy for colds, flu, sore throat, congestion and other respiratory problems for thousands of years because of its antibacterial component. Its antibacterial component is derived from the essential oil from its bark and leaves, according to Antioxidants-for-Health-and-Longevity.com. The dried inner bark itself also has medicinal qualities. Cinnamon works as an antibacterial agent by facilitating the destruction of germs and harmful bacteria. Bacteria in your upper respiratory system can cause inflamed membranes and nasal obstructions, which result in sinus congestion. The inflammation of membranes causes them to become thicker. Inflamed sinus membranes narrow the passageway for air to be inhaled and exhaled through your nose. Since cinnamon is an anti-inflammatory, it may be used to soothe the membranes that line your sinuses and allow you to breathe easier. 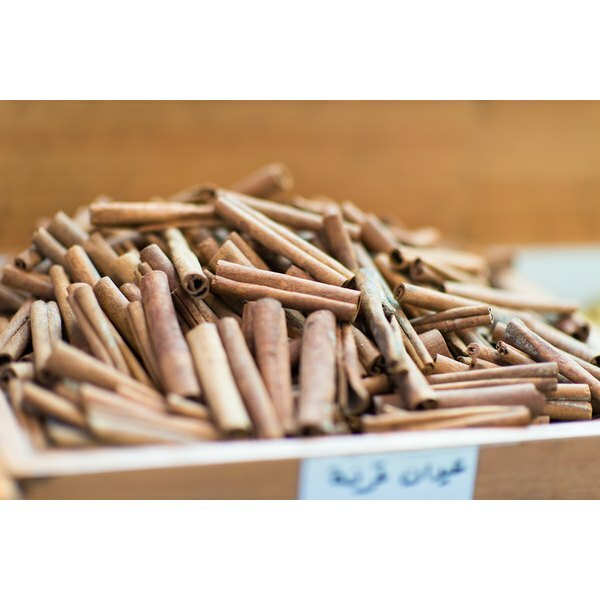 Breathing in the potent scent of this spice is the one way for cinnamon to be taken into the body, but it can also be drank in a tea. The hot temperature of the tea is an added benefit because hot liquids thin mucus, making it easier to rid mucus from your body. Cinnamon's anti-inflammatory quality is also particularly effective in treating headaches associated with colds, according to the Organic Facts website. Although ground cinnamon can be ingested in hot tea, cinnamon oil should not be ingested because its potency can result in harmful effects on the body. It can be applied topically to the skin if diluted first but there is always a risk of an allergic reaction. It should not be applied to your face or other sensitive areas. If left untreated, sinus congestion can lead to an upper respiratory infection. However, cinnamon is very high in antioxidants. Antioxidants are responsible for protecting your body from damage and enhancing your immune system. Although free radicals assist in ridding your body of toxins, too many free radicals are harmful to the cells and tissue in your body. Antioxidants purportedly help prevent diseases by boosting your immune system. Cinnamon is especially beneficial because it has more antioxidants than any fruit or vegetable, according to the "Oxygen Radical Absorbance Capacity (ORAC) of Selected Foods," which was prepared by the U.S. Department of Agriculture in 2007. What Are the Health Benefits of Allspice?